There are several garden spaces on campus, with a broad diversity of grasses, shrubs, and trees. Aside from the holidays, December is a cold and dreary time of year. But if you close your eyes and think of warmer times, the gray landscape will soon give way to lush greenery and blooming flowers. 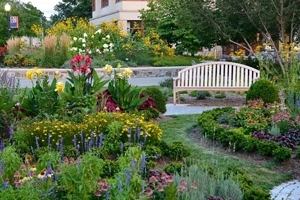 American University's Arboretum & Gardens is one of its most popular campus features. In fact, it is the campus, as the entire school was declared an arboretum in 2003. Yet if you're seeking newfound appreciation for AU's natural-and carefully curated-beauty, a School of Communication graduate student is working on a short film about the Arboretum & Gardens. The filmmaker, Elizabeth Herzfeldt-Kamprath, is currently earning her MFA in film and electronic media, with a focus on environmental and wildlife filmmaking. "The fact that this campus is an arboretum, and we're all part of the campus-there's a very poignant message there," she says. "We need to sometimes take a step back and just realize that this is a gorgeous campus." When the local Trowel Garden Club inquired about donating to the arboretum, AU officials suggested using the money for a student-produced promotional documentary. Herzfeldt-Kamprath, a Center for Environmental Filmmaking scholar, applied and received scholarship funding to make the film. Herzfeldt-Kamprath grew up in southern Oregon, and working at a camp stimulated her connection to the environment. SOC's Center for Environmental Filmmaking made AU a logical destination for graduate school. She'd even visited AU previously, for a leadership conference during her high school years. Nowadays, her favorite spot on campus is between Kay Spiritual Life Center and Massachusetts Avenue. But she says that area looked markedly different during her first visit. "It used to be a parking lot. And they were developing it, so it was like a construction zone site," she recalls. "When I came back for grad school, I saw it and thought, 'I don't remember this at all, but I love it.'" The film will include interviews with AU community members and arboretum leaders, but she doesn't plan to show their faces. Instead, their voices will be used for narration and accompanied by scenic images. She'll frame the film as four seasons in the life of the campus. "I want to show how peaceful and calm it is during the summer. Fall is a bit more exciting, because the students are here. Then winter slows down again, and in the spring, things are starting to pop out of the ground," she explains. "I wanted to capture the energy of each of the seasons." Michael Mastrota is arboretum manager, part of a team that oversees care of the 84-acre campus. A landscape architect with decades of experience, he promotes the arboretum as a resource to the entire community. In an interview, he discussed the past, present, and future of the arboretum. The original outline of the campus was sketched by Frederick Law Olmsted Sr., famed designer of New York City's Central Park and the US Capitol grounds. AU founder John Fletcher Hurst hired Olmsted after noticing his work for the Chicago World's Fair in 1893, but he soon felt Olmsted's AU designs were too informal. The two parted ways-Mastrota says it's unclear if Olmsted was fired or left voluntarily-and AU subsequently hired another architect, Henry Ives Cobb. His designs were predicated on AU as a flat campus-which it's not-and some of those ideas were shelved as well. By the 1950s-1970s, AU grew considerably and many buildings were erected, Mastrota says. "It was kind of a hodgepodge at that point. Nothing really related to one another, at least architecturally. And it was pretty much a commuter campus," he explains. In the 1990s, AU administrators devised a beautification program, and garden officials later submitted plans to make the campus an arboretum. With about 390 species and varieties of woody plants, ArbNet accredited AU as a level two arboretum. "If we get to 500, we reach a level three. We've got a little way to go, but we're making good progress toward that goal," Mastrota says. There are several garden spaces on campus, with a broad diversity of grasses, shrubs, and trees. The Korean cherry trees, near the School of International Service, date to a friendship between Korean leader Syngman Rhee and then-AU president Paul Douglass. The dawn redwood trees derive from rural China, and AU secured them on a farm in Montgomery County. The entire landscape is a continuing source of pride at AU. In November, the annual luncheon arboretum celebration was held in Constitution Hall on East Campus, with university leaders and community supporters on hand. A key part of Mastrota's job is to incorporate the arboretum into AU's academic programs. "I think that helps us be more a part of the campus, and a part of the community, too," he says. Through the work of environmental science students, AU earned certification in environmental planning from the Audubon Cooperative Sanctuary Program. It's a recognition for wildlife and habitat management, water conservation, and resource management. Literature professor David Keplinger assigned students to write poetry from the perspective of a flower on campus. Mastrota mentions seeing AU art students painting or sculpting the landscape. There's also a Kogod School of Business Sustainability Management program, and there was a Kogod class project on how to market the gardens. SOC offers a visual literacy course that has used the arboretum as a topic for web and logo design. A recent AU grad, Caroline Salant, wrote a musical composition about the arboretum and performed it with the AU Symphony Orchestra. Herzfeldt-Kamprath is hoping to utilize that music, and student poetry readings, for her short documentary. "The arboretum really can tie into lots of different academic disciplines that you wouldn't necessarily expect," Mastrota says. The upcoming film could attract future students. Mastrota believes AU's physical space is already a great selling point. "We hear positive things from both parents and students visiting the campus. They immediately notice the quality of the grounds, and it reflects well on the university as a whole," he notes. Herzfeldt-Kamprath adds that social media distribution of the film could reach even more people. "I would love for potential students who are thinking about coming here to see it, maybe get inspired, and think this is a place for them."